The historic run by Mazda from Hiroshima, Japan to Frankfurt, Germany, encompassed 9,300 miles. When we last checked in on the Mazda Route3 tour, it was in Moscow. The tour completed its mission Sunday and entered Frankfurt just in time to kick off the Frankfurt Motor Show, which opened today. 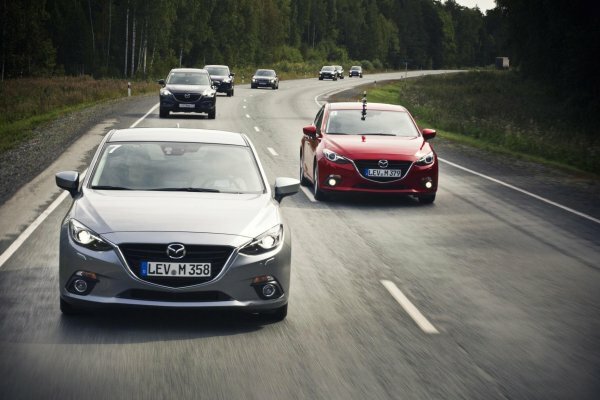 At least four of the 2014 Mazda3 cars used in the tour will be showcased at the show, the other four having been left at locations along the last legs of the route as show cars in various parts of Europe. The tour began in August and culminated in this arrival in Germany. The new Mazda3 features KODO design language, carrying this new look for Mazda and featuring the company's new SKYACTIV platform of technologies. The Mazda3s finished the expedition with nothing worse than flat tires along the way, despite traversing some of the world's worst roadways. The cars saw a total of two continents, five countries, nine time zones, and thirty cities along their route. They were driven in legs by journalists and Mazda dealership owners and employees. Local fans of Mazda often arrived along the route to drive their own Mazdas alongside the new 3s during the route. The final leg saw the 2014 Mazda3 caravan pass through Moscow, Minsk, Warsaw and Berlin before arriving in Frankfurt. Hidden potholes couldn’t stop them. Football-sized rocks couldn’t stop them. Nor could overturned trucks, herds of livestock and roadworks one was forced to drive through rather than around. The only thing that could delay two of the Challenger Tour Mazda3s was bureaucracy at the Belarusian border.